I think it was the colours that drew me but there is such a lot of inspiration had to follow them on Pinterest! This week is their 400th challenge... wahoo ladies that is some inspiration! and they are asking that you make a card that combines one of their past inspiration themes with a birthday card .There is also prizes up for grabs too!Head over there and have a look. Love your CAS underwater scene! This is so cute! 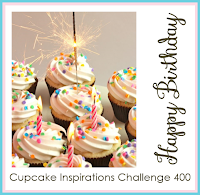 Thanks so much for joining Cupcake Inspirations for our 400th Challenge! This is so sweet....love your adorable trio of cute fish! Thank you so much for playing along with us at Cupcake Inspirations 400th Challenge! What a sweet card and fantastic coloring! 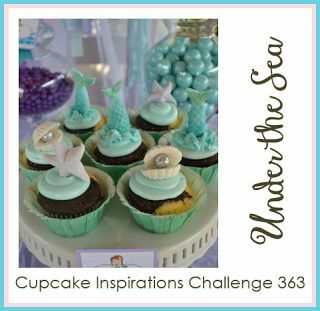 So glad you linked up to Cupcake Inspirations 400th challenge. What a beautiful CAS card. Love how you used that old underwater theme!!! Thank you for joining us for our #400th challenge celebration!! !